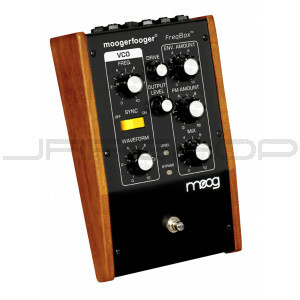 It’s here--the newest addition to the Moogerfooger line of analog effects. The MF-107 FreqBox will blow you away! it’s unlike anything else out there. The FreqBox does not actually modify the audio input signal. Inside the FreqBox is a Voltage Controlled Oscillator (VCO) which is modulated by the sound source input—an Audio Modulated VCO! The result is an amazing array of effects that were once only possible with a complex modular synth setup—everything from fuzz-like distortion to what product development engineer Steve Dunnington calls “cataclysmic timbral morphing” A true “freak box”!